As you may know, Leopard ships with a controversial icon for Windows Machines on the network, it’s a beige monitor with a Blue Screen of Death (BSOD). While this was pretty funny in the developer builds of Leopard, I think it’s a little tasteless for the retail release. I use a Windows machine right alongside my Macs every day, and I didn’t want to stare at this icon when I was networking between them. 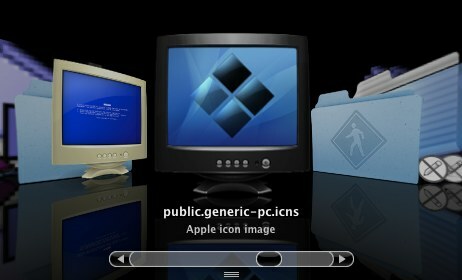 I was reading how to replace the BSOD Windows Network Machine icon from Leopard with a generic Mac monitor icon at Engadget. I wanted to replace it, and I thought this might be a good time to find out how icon creation works on the Mac. This was my first icon (on any system really) and is really just a modification of the existing BSOD icon and the Bootcamp icon. If you want to use this icon yourself, you can grab the icns icon file here. Here are the instructions on how to install it, modified from Engadget’s article. Now go to Contents/Resources/ and you will see a bunch of icons. Drag the wincomp.icns file into this folder. It will prompt you to authenticate and enter your admin password to make changes to this folder. Now log out and log back in and things should be swapped. This is my first icon, ever, so I know it’s not pretty… hopefully I’ll take another shot at it once I know Illustrator better and I can make some nice vector art. 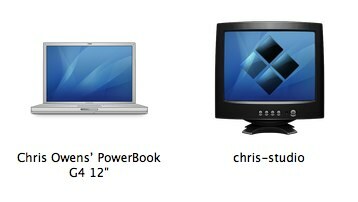 Above, you can see my Windows icon next to my 12″ Powerbook on my network. Looks good for your first icon! I need to get on the Leopard bandwagon sometime soon. How are you liking the transparent taskbar? The menubar? It doesn’t bother me that much. It does feel like it’s ‘dimmed’ out or something, but I have gotten used to it. Chris! Man you just keep popping up everywhere–I got here from dashes.com. By the way, nice work. While your concept is nice, you are still using the OS X Tiger wallpaper which gives it a sort of confusing look. The Vista wallpaper or better still the XP “bliss” wallpaper would look just right. That’s a good point Goobimama. I use any wallpaper on any system, so that detail didn’t come out as critical when I was making the icon. It is a great point though. Thanks for the heads up Aaron. I’ve fixed the link. Nice job for your first icon. I like it a lot, although I think it would be nice, and a little more ‘Windowsy’ if you used the Bliss background instead of the default Tiger background. That might be something easy for you to do and make an alternative icon. Once again, excellent job. I’m going to enjoy this icon a lot more than the tacky BSOD icon.